The ascending rents continue to make the local news. Below is a recent article from the Idaho Statesman. 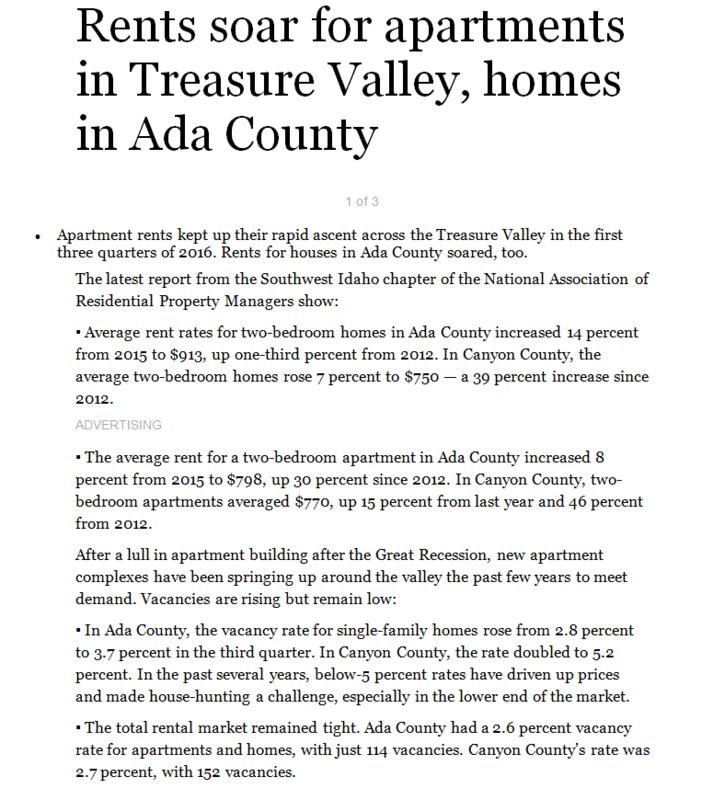 The author cited the SW Idaho Chapter of NARPM's rent and vacancy numbers and quoted a local property manager who finds low cost housing for veterans. As I mentioned in the article, If population and employment continue to grow, I don’t see any indications that the rental market will slow in 2017. The amount of new construction scheduled and the timing of their completion may affect rents. Even with an exceptional vacancy rate, newly constructed apartment complexes are 100% vacant and it is common to offer rent concessions to fill units quickly. With the possibility of several new developments and hundreds or even a thousand new units completed around the same time, those rent concessions likely will soften rents at existing and competing rental units.